Rustin Gudim/The Aspen TimesRoaring Fork players celebrate Monday's 3A Western Slope district-tournament play-in game victory over the Skiers at Aspen High School. ASPEN – Wins have been scarce for the Roaring Fork girls basketball team this season. It was not about to let this one slip away. The Rams battled back from a six-point, third quarter deficit and matched baskets with Aspen during a tense fourth quarter in Monday night’s 3A Western Slope North division district tournament play-in game. Sophomore Hattie Gianinetti put fifth-seeded Roaring Fork ahead for good with two clutch free throws with 23.6 seconds remaining, and a visibly poised Rams side hung on for a 42-41 victory. 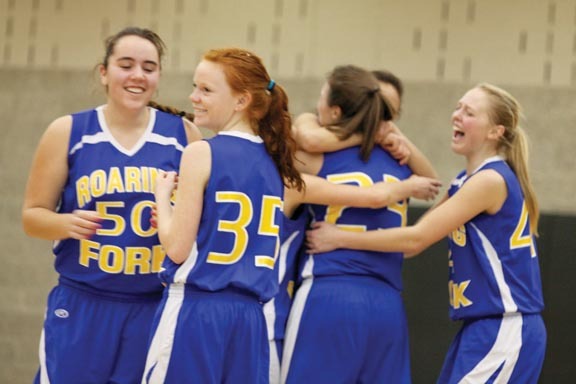 The effort helped Roaring Fork (2-17) extend its season and clinch an improbable district quarterfinal berth. It will visit Olathe (16-3), the top seed in the Slope’s South division, at 6 p.m. Wednesday. The Rams struggled mightily early and wilted down the stretch in Feb. 11’s game in Aspen, losing by 12. Not this time. This seesaw tussle saw the two teams tied at 11 after one quarter and at 22 at the break. Neither led by more than three in the first 16 minutes. The fourth-seeded Skiers (5-15) gave themselves some rare breathing room with a 5-0 spurt in the first three minutes of the third quarter. Hayley Kremer and Bailey Everhart each made free throws and Jonelle Berklund buried a 3-pointer during the stretch, putting Aspen ahead 27-22. After a free throw from Gianinetti and a long jumper from teammate Georgia Ackerman with 3:32 remaining, Everhart shook free and scored, then pulled down an offensive rebound and finished off the glass, giving the Skiers their largest lead of the game at 31-25. After the two teams hit 3s, Kaleigh Wisroth scored underneath to trim Roaring Fork’s deficit to four heading to the final quarter. Roaring Fork finally pulled even at 40-all with 2:15 remaining, when Jen Pena corralled a perfect cross-court pass and scored. After an Everhart free throw and a few empty possessions by both teams, Gianinetti pulled down a defensive rebound and was fouled with 23.6 seconds on the clock. Both of her free throw attempts hit nothing but net. The Skiers pushed the ball across midcourt and called a timeout with 15.5 seconds to play. Roaring Fork swarmed the ball after the inbound pass, forcing a jump ball that gave it possession with 11 seconds remaining. Gianinetti was fouled soon after. She missed the front end of a one-and-one, giving the Skiers some life. Anna Stevens attempted to fake out a defender and generate some space for a shot attempt on the ensuing offensive possession, but the Aspen guard was whistled for traveling. The Rams inbounded the ball. The buzzer sounded soon after, and the visitors’ bench erupted. Everhart, who finished with 17, dropped to the hardwood and buried her head in her hands. Teammates could do little to fight back the tears. There will be no district-tournament run or playoff berth for the Skiers in 2011. Roaring Fork, meanwhile, has guaranteed themselves at least two more games; should they lose to the Pirates on Wednesday, the Rams would play in Thursday’s consolation semifinals. Win there and in Saturday’s consolation final in Palisade, and Roaring Fork would clinch the Slope’s fifth and final playoff berth.